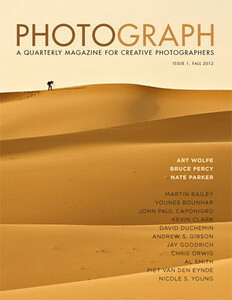 David duChemin in his Letter From The Editor stated he wanted Craft & Vision‘s new eMagazine, PHOTOGRAPH, to be a place where the artists and the geek can find common ground; a place where photographs themselves are not used as mere illustrations, but are, in fact, the point of the thing. Did that resonate with me. I have always explained to people why I love photography so much is that it keeps both hemispheres in my brain active. The creative (left) side is feed by looking for pleasing compositions, light and shadow, looking for messages and feelings to convey. The analytical (right) side enjoys the gear, exposure numbers to be worked out, lenses to be used and speedlights to be set up. All of which goes into creating a photograph. How I enjoyed these portfolios was to look at each of the photos and enjoy them. Let my mind and eyes wander. Let myself feel each photograph. Later, I would then go back and try to learn from the photos. What made each one unique. What elements did I like about each and what I might have not liked. This is something I do not do enough off when online as things like notifications, emails and such grab my attention. Another plus for this being an offline publication. After each Feature Portfolio is a short Q&A session with the artists. Questions range from how they got started, to what inspires them to how they go about their work. Very candid and I was intrigued by Bruce Percy when he said he is very intuitive and works fast. This is something I do at times. In this first issue of PHOTOGRAPH, a few of the columnists really spoke to me. The first by David duChemin on The Art of the Edit. He explains how easy it is today to make hundreds if not thousands of images with our digital cameras. Then we have to take the time to go through all of them to find the gold, those coveted 5 star photographs. He advocates after we learn the mechanics of making a good photograph, we then turn to concentrate on the art of photography. Learn to “shoot for the edit” instead of shooting in bulk to find the gold. This is something I have been considering for some time. In fact, the lesser number of photographs I have taken on recent trips and photowalks has been more satisfying then getting a couple of thousand images and having to work through them. Discarding most of the images taken. The second by John Paul Caponigro on Creative Composition. This one was more on theory and how to think about composition. He pushed my mind to consider new ways of thinking about composition which will lead to better seeing the next time I am out with my camera. At the end, he gives ways you can use editing software to see relationships within a digital photograph. A good complimentary article to David’s. The third by Chris Orwig entitled The Missing Spark. In it, he talks about as a teacher of photography and a very good one, he found himself burnt out. Though he could see and help others out of it, he could not help himself. His discussion using wisdom from many people both artists and spiritualists created connections inside myself as I read his story. I recognized the traits he talked about in other people I admire and noticed the ones I had not considered or felt myself. These are the articles I loved in the first issue of PHOTOGRAPH. Other articles talked about studio lighting, lenses, using LightRoom for B&W conversions, color management in digital photography, photography gear and a fun essay by Nicole Young. Something was missing and I finally figured out what. No ads. Because of the self-publishing model, PHOTOGRAPH is being funded by sales just like eBooks. I found it extremely refreshing going through the portfolios and articles and not having to scan over ads which would have distracted from the images or content I was reading. Maybe you would like to see for yourself. Craft & Vision is offering a one-year subscription for $USD 24 – that’s four issues for the price of three. And because they would rather you have a chance to do this risk free, you can buy Issue One for $8 and, for a limited time, buy the rest of the subscription ($16) once you have had a chance to read Issue One. They will send a short email to anyone who purchases Issue One, and you will have until the end of November 2012 to opt-in to the rest of the one-year subscription. This entry was posted in Photography and tagged art wolfe, craft and vision, david duchemin, emagazine, magazine, photograph, photogs, togs. Bookmark the permalink. Purchased the first issue yesterday but have not had a chance to read it yet. Now I’m really looking forward to curling up with my tablet and pouring over this issue. Thanks Scott. Let me know what you think of it, Mike. I really enjoyed the layout, the portfolios and the creativity columns. I’ve just started the section with all the articles and I know I will need to re-read a few of them to get the full affect situated in my head. I can see me getting a subscription to this when I’m done with the first issue. I have always enjoyed (and learned) from David duChemin’s books as well as the ebooks from his Craft & Vision site. Such a great resource for me.